Strood Yacht Club is situated on the tidal waters of the River Medway and is within easy reach of the Thames Estuary and Allington Lock. 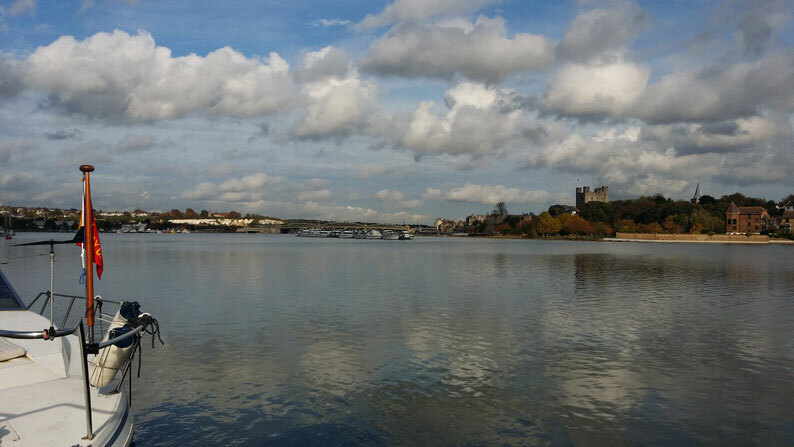 We overlook the historic Rochester Castle and have easy access to the A2, M2 and local rail stations. The club was founded in 1945 to promote boating and sailing on the Medway and has done so successfully for over 70 years. We are a private members' club supported entirely by the fees paid by our members and the commitment they make to run, maintain and develop the facilities. From time to time we do have moorings available (although as of early 2019 we are full). First you need to become a social member for a period to prove yourself willing to help. Interested? Please complete a Contact Form on the menu.